Save Mohegan Lake: Yorktown: Do You Want Random One Acre Parcels Rezoned To Multi-Family? Yorktown: Do You Want Random One Acre Parcels Rezoned To Multi-Family? Maybe you do. There is a need for such housing and some Zoning Districts allow for it. Not the single family zones (the R-1 districts), but the multi family zones (R2, and R3). Also, the Commercial Zoning Districts. The Yorktown Planning Board Director and the Town Board seem poised to rezone a one acre parcel in the center of a single family zoning district, right next to George Washington Elementary School. It would set a dangerous, dangerous precedent and you should be concerned about the value of your home. Live on a busy road in a residential zone? Near a school, or church, or daycare, or doctor's office, etc...? Those seem to be the two criteria they are using to justify this rezoning. It's very close to Cortlandt (across the street, literally). You might think that is R-2 or R-3, but you'd be wrong. It's all single family zoning there. The Planning Director is terribly confused. He said that the "parcels immediately adjacent [the subject 1 acre parcel] underwent significant "up-zoning'" and he references GWES and the Islamic Center "and all the way east to route 6." Nope, no up-zoning there. 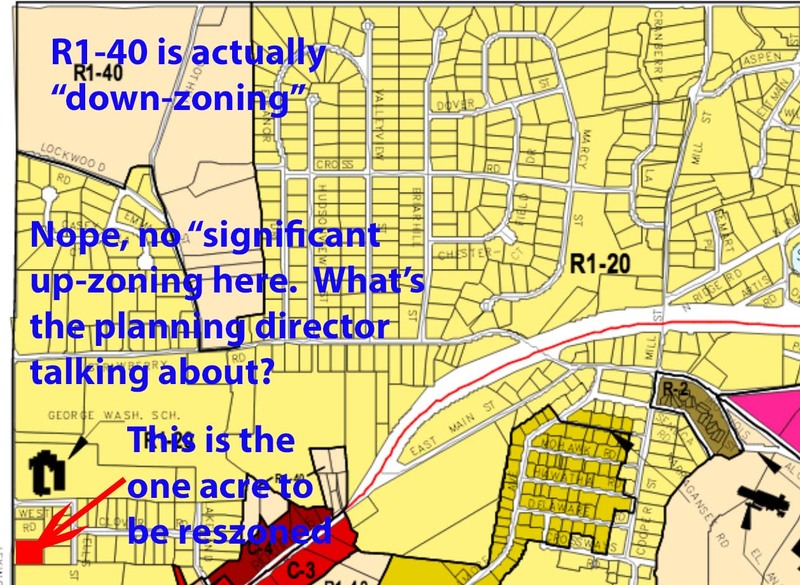 See the marked up zoning map below. He also said there was up-zoning on the Hunterbrook. Pfffft. We, to date, have not seen an "as of right" plan, meaning a plan that does not require any variances. The developer presented something that fit within the setbacks, but didn't comply with building code so it was not a feasible design--as noted by the Planning Director in the video; somehow he arrives at the conclusion that the plan requiring elimination of over 50% of the side yards to build the building was "the best plan." Whoa there. What we should be presented with is a scheme that complies with code and zoning as of right because--as Councilman Bernard reminds us--the board is not considering the site plan or parking plan or building code--they are only considering the rezoning. Soooooooo, if that's true, show us what would be allowed without requiring any variances whatsoever. Isn't that a reasonable request? That's enough for today, but--please--do pay attention to this application. Maybe re-zoning random one acre parcels is the way to "move Yorktown forward." If you live in the light yellow zone, be afraid. Be very afraid. Or, in the alternative, petition the Yorktown Town Board for a re-zone of your single family house to R-3, cash out, and buy a house in a normal town.